Ah, summer. Strawberries and cream, the smack of leather on willow and you wielding the mightiest weedhacker known to man. But it's not all hard work - modern tech has taken the tedium out of tending your garden. Heck, you might even have some fun. After months of sitting indoors playing videogames, your muscles are now so weak you can barely lift a blade of glass, never mind cutting thick branches off the local shrubbery. 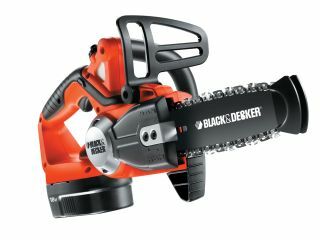 The 18v Black & Decker Alligator helps you out with Ni-Cad battery powered jaws that turn branches into wood chippings, with up to 150 3.5cm cuts per hour. Blisters? What blisters? Face it, you'd rather have a drink yourself than water the garden, especially when the latter involves tedious to-ing and fro-ing with a heavy, messy watering can. Luckily, hosepipe wizard Hozelock has come up with the AquaPod - an automatic watering system than can help you keep between 10 and 39 potted plants alive. The kit comprises two green cylindrical AquaPod pumps, a series of flexible hoses and drippers, and an AC1+ water computer that you can program to get the AquaPod automatically watering for you. Hozelock says the AquaPod takes just five minutes to set up and uses 90 percent less water than a watering can - so it's eco-friendly, too. Grass might seem like an easy option for the reluctant gardener, but as your grandad probably told you there's an awful lot more to it than a quick mow once a month. The Bosch ALR 900 keeps your lawn in tip-top condition by raking, scarifying and aerating it - enabling you to keep leaves, moss and other lawn problems at bay. The ALR 900 comes with a 900W electric motor and an innovative jet fan to scoop up 60 per cent more debris than lesser machines. It even includes a folding grass box with a capacity of 50-litres. Petrol strimmers might seem a bit old school in this company - but the Ryobi RLT-30CET is a weedhacker with a difference. Instead of forcing your puny arms to pull on a starter rope to get its 30cc engine to fire, it comes with a unique electronic starter - you simply push the TouchStart button to go - just like on a Ferrari. True, the Ryobi's 1bhp can't match that of the Maranello marvel, but when did you ever see a Ferrari hacking down nettles? Exactly. There's undoubtedly something primeval about fire + roasting flesh - but that doesn't mean you have to wear an animal skin and call your girlfriend Ug. The Redfyre 33 barbecue features four stainless steel burners instead of old-fashioned charcoal and even packs in a ceramic rotisserie burner and spit for suckling pigs and suchlike. The Redfyre 33 also doubles as a smoker, ridding your food of unwanted fat, gristle and carcinogens, while retaining that wood fire taste. Best of all, the Redfyre 33 is an absolute bargain - it used to sell for £1,179.